The auto rickshaw driver stopped in front of a towering office building. Around it, men loitered under scraggly neem trees, spitting paan juice onto the stone steps that lead to the bureau of motor vehicle’s office. This was not my first visit to the bureau. I had come a week earlier to pick up a driving manual. I had climbed four flights of stairs and been directed by many men in the over-crowded hallways until I found the office of Mr. Gupta. He sat behind a large desk, hands clasped in front of his chest as I entered the office. He cast a skeptical glance at me when I explained why I'd come before opening a draw and pulling out a driver’s manual. “Study this book. It contains all the information you will need to know about driving on India’s roads safely,” he said, teetering his head from side to side. Over the next week, I studied the book Mr. Gupta gave me and was now back to see if I could prove I knew about India’s road rules and pass the knowledge test required by the Indian government. The halls were just as congested with men as they had been the week before. I squeezed between them. 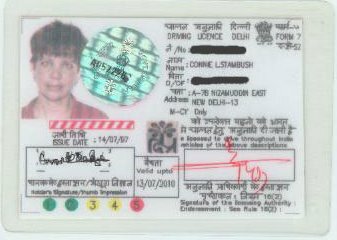 Most were there to get either their licenses to drive auto rickshaws and taxis, or were in line doing the legwork for the men who couldn’t be bothered to do it themselves. The building was dark due to one of Delhi’s frequent brownouts and smelled of body odor, cigarettes and urine, knitted together in 120° heat. It was an overwhelming sensation but not an unfamiliar one. Mr. Gupta smiled, greeting me like an old friend when I entered his office. “Hello, hello,” he began, before launching into a series of pleasantries about my well being. I had dressed in my best salwar kameez for the test. I’d lived in India long enough to know dressing up for the meeting could be beneficial. I declined his offer of tea; I was nervous and wanted to get the test over with. “Very well,” he said, leaning back into his chair. “Have you studied the book?” He eyed me with such directness, I wondered what he knew that I didn't. But I assured him I had and he began the test. He pointed to one of many road symbols printed on a form trapped under the glasstop covering his desk. “What is this?” he said, stabbing a thick finger at the symbol for "hair-pin turn." I explained the symbol’s meaning and what action I was to take as a driver when I encountered this symbol but Mr. Gupta shook his head and pointed to another image. Again I explained it and again he shook his head. He pointed to a third symbol and I described its meaning. Mr. Gupta shook his head a third long shake indicating to me something was wrong. “I did,” I said. I couldn’t understand what the problem was; why had I failed? I knew the symbols – narrow lane with bridge, hairpin turn ahead, do not pass. Mr. Gupta picked up the driver’s manual and began reading the meaning of each symbol he had pointed to while testing me. I heard subtle differences in the words he read and those I had chosen to describe the signs’ meanings. I had been wise to wear the startling blue salwar kameez because even if Mr. Gupta’s ears didn’t work so well at least his eyesight hadn’t failed him. Besides, I knew the road symbols and had been practicing on quiet streets for weeks. I was ready for real traffic. Mr. Gupta informed me I still had to pass the driving test. For that, I would have to return on Saturday. “You will need to bring your bike,” he said. I nodded, knowing that a fancy suit would not help me pass the riding test. This time I would have to demonstrate my skills to the tester's satisfaction. On Saturday, I arrived at 9 am to find a crowd of young men bunched under the only tree giving any significant shade. They were gathered on the side of a street with a boulevard full of shirts drying on a fence and a juice wallha selling exotic cocktails. I parked Kali next to the many 100cc Kawasakis that the men had arrived on, dismounted, shrugged out of my denim jacket, pulled my helmet off and walked to the end of the line to wait my turn. There must have been 50 men waiting, and every one of them turned to look at me. The smell of oil and gasoline was strong and I was dreading the long wait when I saw a man at the front of the crowd waiving a clipboard and shouting. One by one, the men turned to look first at him then back at me, then repeated the words of the man with the clipboard. The words piled up in a rumble that rolled toward me like a wave and I couldn’t understand any of it until someone nearby helped me out. It was not unusual for a woman to be escorted out of a crowd of men. At train stations women have their own ticket-buying lines, waiting rooms and coaches on the trains. If a woman walks into the post office, she either goes to a line for women only or is ushered to the front of the men’s line. In India’s segregated society it is a common practice. So, I should not have been surprised that I was being given that same courtesy now. But I was. Since swinging my leg over Kali for the first time, I had not felt feminine. I hadn’t felt manly, just not womanly. In any other line I wouldn’t have minded one bit going to the front, but now it somehow seemed wrong. If I was going to ride a man’s machine shouldn’t I also do as men do? Shouldn’t I wait my turn like all the men were? I looked at them, waving me forward, saying, “Go, madam.” I may have felt bad bumping all those men but they seemed okay with it and to refuse would have caused more of a ruckus than I was up to. I pushed Kali out of the line, rolling her past the Kawasakis and Vespas to the man with the clipboard. I had no idea of what to expect, and looked around for the testing area. But there was no designated testing place like there would be in the States. I handed the man with the clipboard the papers Mr. Gupta had given me. He glanced at them briefly then instructed me on what to do. “Ride to the end of the boulevard, turn right and come back to me,” he said. I looked at the traffic. It was light and the street was broad. I geared up, mounted and kicked Kali to life. The man testing me nodded and spit a thin red line of paan onto the pavement. I checked the traffic behind me before pulling out. As I rode I wondered what other skills I would be required to demonstrate before becoming legal to ride in India. I glanced in my rear view mirror to see what the man testing me was doing. I thought I would see him jotting notes on the clipboard, but instead I saw the back of his head. The moment I pulled way from the curb and into traffic, he had stopped watching me. He wasn’t judging my riding skills at all. When I rode back to him, he handed me my paperwork and told me to go inside for the license. As I walked inside, it dawned on me that in India a license and skill were not the most important things to have. The most important thing was to make it back in one piece. And to make it back in one piece I would need luck. Good Luck*. There is only one way to get that kind of divine intervention. Drivers all over India know it takes the blessings of the gods and goddesses to survive the roads of India. That is why they drap garlands of marigolds over their trucks review mirrors and place burning sticks of incense on their vehicles' dashes. I had made a good start by naming the bike Kali – one of India’s most powerful goddess, but to ensure my safety, I was going to have to do more. I needed to choose a path that would take me to the holiest places so I could pay homage to Kali all along the way. And I was about to find out there were 51 such places scattered across all of India. When I see an Animal crushed by speeding vehicles, I wonder if they could do the same to a Human Baby. Goodluck to those Ignorant License Holders who read? hey i went through the same situation even though my bike riding skills are mediocre hope i get my license. Contents of this website are good and appreciative.